Mercure Hotel Berlin City West. Book online now! Free Wifi! 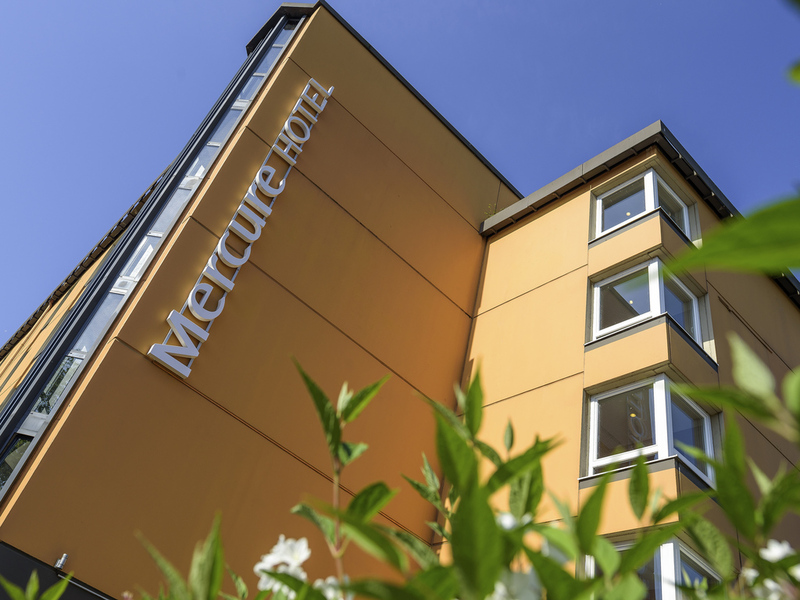 The 4-star Mercure Hotel Berlin City West is conveniently located near the Charlottenburg district, not far from the exhibition center. All 119 modern, air-conditioned rooms have free WIFI. Use our 8 meeting rooms for your events in our CCH-certified hotel. If arriving by train, the nearest ICE train station is Berlin Spandau. Tegel Airport is 1.8 miles (3 km) away; Schönefeld Airport is 18.6 miles (30 km). The A110/111 is the best way to reach us by car and the subway line 7 is in front of the hotel. Berlin is Germany's political capital - and the capital of art, culture, alternative lifestyles and pure zest for life. The city's diversity is unrivaled worldwide: you will be amazed at how much there is to discover. The 119 rooms in the 4-star Mercure Hotel Berlin City West are air-conditioned and have free WIFI access. In our Privilege Rooms, your comfortable bed is in a separate sleeping area. On request, your children can stay with you in a spacious family room with 2 areas with a connecting door. A child aged up to 12 years may stay in your room free of charge. Your pets are also welcome at the Mercure Berlin City West hotel (surcharge of EUR 15 per night). Check out: Defects were listed. These are well-known and fairly often occur. It seems so: These defects are well-known and fairly often occur. Although this hotel is located in a sleepier area of Berlin, it is located right next to a metro station, making citywide access a snap. Plus the rooms are quite spacious by German standards. That, combined with the great service and the affordable (and delicious) meals in the hotel restaurant, make this a great choice for business and leisure travelers to Berlin. Not a charming place, close to the airport and good value. The hotel is located close to the airport, very good when having an early flight. It is not a very charming place directly, our room was functional,it was proper. bed was averagely good. We found that staff were helpful. It is a good value. Dear WooStockholm, thank you for your rating. I would like to pass on the positive feedback to our employees. Best regards Stefanie Bobon - General Manager. Not very charming place to stay as a visitor, but good access to TEGEL airport. I did not have high expectation on this stay because it was just a short stay before heading to TEGEL airport the day after. Room, is was clean and functional. The bed was good enough for a short stay. It is visible that this hotel is in need of renovation. Staff were helpful and polite. Otherwise this hotel was good if I would need to take an early flight. There is no wardrobe in the room. No Polish language tv channel, although there are many Polish guests in Berlin. In the dining room the seats (not chairs) destroyed, rubbed, nastily stitched with thick threads, like in a subordinate bar in the suburbs. Very nice and professional service, the hotel clean, but the standard certainly differs from that which should be assured in a 4-star hotel. Location perfect for those who came for fairs. Accommodation is ok, but nothing more. No wardrobe, relatively small bathroom. Glass door to the bathroom are not working properly in room 407. And the other person in the room has to listen to all the sounds from bathroom because of this door. Seats in place with breakfast are old and cracked and stitched with thick threads. In our opinion it is not a standard for four stars. Very nice and helpful reception staff and other people. Would be nice to have some polish channel in tv, at least Tv Polonia. There is a lot of Polish guests in Berlin. However breakfast was disappointing And the welcome drink should be be limited to a bottle of water. This is not a welcome drink. Quick access to Berlin metro system. Easy grapping of breakfast. Quiet rooms. front desk employees are very friendly. BAD: Had a broken shower handle. reported it on Friday. Left on Tuesday and issue was still not fixed. Service in the restaurant is pretty slow (15 min to get scrambled eggs, every morning!). Young and inexperienced. Though I keep coming to that hotel for years now, people at reception keep asking me for address on the arrival. GOOD: Renewed bathroom looks good now. No wecome drink for ACCOR GOLD members anymore. Broken lift. Malfunction of the safe. I used the safe many times, I have stayed in your hotel many times over 5 years now. I use a number for the safe I cannot forget but it malfunctioned and locked on first entry of a code. I had to wait until next day before I could get my PC out of the safe. The lift was broken across all days of my stay (4 days). I had no welcome drink offered as usual as a Gold member. I am concerned about this change. On a positive note, the upgraded bathroom is appreciated, its nice now. We arrived early (12:00) and were pleased that our room was ready. (We we’re planning to just drop off luggage) we were checked in quickly and all was well. We were disappointed that there was no shuttle to the airport. We had booked here due to close approximatity to airport. Also, the elevator was broken so we had to carry luggage up 3 floors. The last straw was that the air conditioning was not working. I had specifically booked this for the air conditioning and it was extremely disappointing. Very good location. Pleasant manager. Tasty breakfast. Clean rooms. Staying in this hotel for 3rd time and every time we are very satisfied. The hotel is conveniently located but it has been needing upgrade for some considerable time. The bathrooms are old and the pool can do with a cover and heating for the winter - then it will be fabulous to stay there! I don't like the bar pouring a 200ml glass instead of 100ml and then charging 12 Euro for the glass- horrendously expensive! The coffee in the room is not replenished unless asking. This goes for cups, sugar etc. Could I also please get a spoon instead of timber sticks!? The laundry takes for-ever, service on Saturday is expected, at least return laundry given in on Friday by Monday by Sunday night please. Rooms need be checked before occupation - this time the safe did not work when I got there. Then, the replacement room was a bit smelly from the drains, until I poured some soap down the drains.